We truly respect and love trees. All the way from mightiest of the Oaks to the tiniest Maple we love them all. Yep, we even love the problematic Pine trees and Sweetgums. Are you aware of the benefits of tree pruning? Proper tree pruning will increase the life expectancy and overall health of a tree. Tree pruning will also greatly reduce the risk of the tree failing due to severe weather events. It is no secret that a well maintained tree is a happy tree. Tree pruning is an essential part of tree maintenance. It is probably the most common tree maintenance procedure. When done correctly it is extremely beneficial for your tree and can have great long term benefits. Trees in a forested setting grow great with only Mother Nature’s pruning. That is not true for trees that grow in urban settings like Charlotte. These urban trees need more attention and care than their forested relatives. Occasional trimming and pruning may be necessary to help maintain health and structural integrity and improve aesthetics. All pruning should completed by a person that fully understands the physiology, anatomy and biology of a tree. Improper pruning will cause long lasting damage they may have adverse effects and could even shorten the tree’s life. Every cut that is made has to be carefully considered because it has the potential to change the entire structure and growth pattern of the tree. Just one single mistake or wrong cut can ruin the whole tree. Here at Arbormax tree service we are completely dedicated to providing your trees with the care that they need and we always provide the best possible tree pruning. Above all else we keep the health of the tree in mind. Our Arborists thoroughly examine every tree before they make the first cut. A well thought out pruning plan is developed for every tree. All tree pruning plans are developed to meet the trees current needs while taking future growth and development into consideration. We truly understand how trees function. We know what it takes to make them healthy and we understand how they grow and what influences their growth. Knowing all of this we are able to proactively prune to redirect future growth the direction we want it to go. Below are some reasons for pruning trees. We prune for a variety of reasons. Sometimes it is for safety and sometime we prune just for aesthetics. 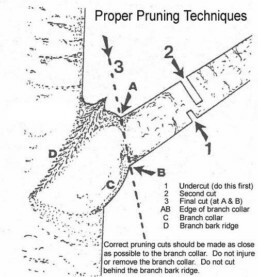 One of the most common reasons to prune is to provide clearance to structures. Regardless of reason or function we are the best choice for Trimming and pruning anywhere in the Charlotte area. Cleaning is a pruning procedure that primarily removes dead, dying and unhealthy branches from the crown of a tree. Elevating/ Raising is the most one of the most common types of tree pruning. Raising/ elevating usually removes the lowest branches of a tree. This is typically done to provide clearance to a building, driveway, sidewalk or other structure. Thinning involves the removal of select branches to improve the structure of a tree and reduce the overall density of the crown. Thinning promotes better wind flow through the tree and as a result reduces the amount of force that is applied by wind. This reduced force decreases the trees chances of being blown over by strong winds. Thinning also increases light penetration and photosynthesis on the interior of the crown. Proper thinning reduces weight on heavy limbs, and helps a tree retain the it’s natural shape. Reduction is a pruning process that reduces the size of a tree. This method of tree pruning is often used for utility line clearance. There are various forms of reductions. Some are harmful such as topping. Always consult with an ISA certified arborist prior to develop a pruning plan. We always follow these pruning guidelines. We never use climbing spikes when pruning trees. Using them will unnecessarily puncture that parent stem and its vascular system. This could possibly compromise the tree’s health. We will not remove more than 20% of a tree’s overall crown. If more than 20% is removed the tree’s photosynthetic potential may be plummet to unacceptable levels this will stress the tree and could kill it. We make every attempt to make cuts that will redirect any future growth into ample sized lateral branches. Not only will this reduce water sprouts, it will promote new growth into a different direction. It’s never a good idea to remove limbs that exceed four inches in diameter. Wounds that are larger than four inches have a hard time healing over. Open wounds allow water and fungi to get into the structural wood and these cause rot and decay.